There are things in life that can't help but radiate hope with everything they do. One of those things is a sunrise. Not only are sunrises beautiful, but they bring with them the hope of a new day. They announce, "we have made it through the night!" They symbolise the hope of the day to come. Maybe this day will be unlike the rest. Maybe it will be better. Maybe I will be better. The other day I was on the bus on my way to work (at around 8:30) and had the pleasure of seeing the sun rise on Edinburgh. It was such a beautiful sight...weaving my way through the city on that double-decker, getting glimpses over the castle, over the chimney tops, over the meadow. It was such an experience! It put a smile on my face that really set me up for success for the day. Today, once again on the bus (and again, on my way to work), I saw what I think might be the first signs of spring. 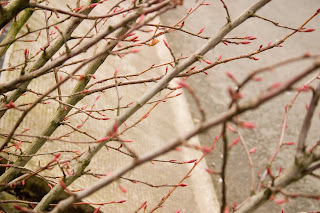 On close look, I noticed very small buds on the trees! This gave me a hope...the dark, cold, wet days that I am now enduring will not last forever! Immediately, flashes of me laying in the sun in the park came into my head. I imagined tank tops, snow cones, flip flops and more! Now, all of this may just be an imagination here in Edinburgh, but in just a few short months I will still be here to find out!